My trip to Cyprus this year had to include another trip to Fyti to meet with more of those wonderful weavers who are participating in the Voufa initiative instigated by Maura Mckee, Sarah Dixon. These two women, one a weaver in Northern Ireland and one an artist in the UK have made great efforts to get more attention and interest from both designers and artists, especially in Cyprus, for one of the more unique traditional crafts of Cyprus, Fythkiotika weaving. Here on their website promoting Fythkiotika, is a report of a seminar Maura presented at the Frederick University in Lefkosia last year http://phitiotika.wordpress.com which includes a link to a video showing the process from start to finish of preparing the threads for the loom. One of the women featured on the video, Mrs EIrini Diomidous, was working at her weaving when I arrived and I managed to have a chat with her. This was one of those occasions when I wished my Greek was a little more comprehensive as I wasn’t always able to get the finer details of what she was telling me but we managed. The large room in this restored old building was filled from floor to ceiling with fine examples of fythkiotika made by the women of the group. All the pieces were for sale, many of the designs were copies of old pieces, all were beautifully intricate. I of course came away with a few examples. 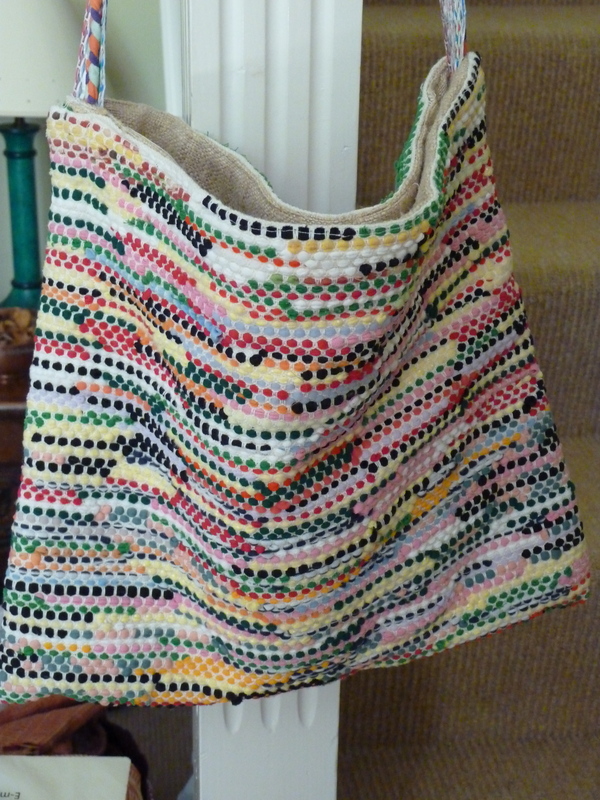 One of them was this rather funky bag which looked like it has a silk lining in a hessian type weave, this I later parted with reluctantly as I’d bought it as a present for my sister. The loom that Eirini uses has been in her family for a least a hundred years and is still going strong, with the handy use of chicken bones to hold certain things in place, this is common I’m told. Normally there would be a small wooden bobbin type mechanism . Although visitors come from far and wide Eirini told me she would like to be able to sell more of the finished work as there is not enough trade at the moment to cover all the overheads as well as give the weavers a fair reward for their efforts. I’m sure there are many people who would love to own a piece of this unique work if only they were aware of it. Fyti is a small village found up on the lower slopes of the Troodos mountains halfway between Polis and Paphos. The scenery is spectacular up here and it makes a lovely excursion. The weavers also work in silk which they cultivate themselves. Above you will see a picture of some silk worms gorging themselves on the mulberry leaves and starting to work their cocoons. I found this video of how they grow silk worms and harvest silk in China, fascinating, obviously this is on a commercial scale. It’s a good job smoking is no longer allowed in bars. Mrs Mavrellis at her loom. My cousin Michael did a bit of scouting for me this week, he spotted an article in the Phileftherios paper, about a young designer Othonos Charalambous using Fythkiotika in his designs. He very kindly posted it to me and as it was all in Greek I cheated and looked him up online to find his website. My Greek is limited and although I can read Greek, it takes a lot of dictionary searching and time to get the meaning of articles. This young designer is a Cypriot born in Cyprus but studied here in the UK and after gaining a Masters in menswear at the London college of Fashion has just launched his first full-scale collection. I was thrilled to read about this designer using such a traditional and well – loved weaving technique in his designs, through reading his short bio it’s clear he has great appreciation of the heritage and skill involved. http://www.othonascharalambous.com. When researching online for ‘Androula’s Kitchen’ I came across a website called Phitiotika http://phitiotika.wordpress.com set up by two young British artists, Maura a weaver from Ireland and Sarah an artist. These two women felt great empathy for the weavers of Fyti the beautifully situated village high up on the hills near Paphos, a dwindling community like so many with no new generation coming along behind them to carry on their skills. Maura and Sarah set out on a quest to raise awareness and engagement in this dilemma. They worked in co-operation with the Laona Foundation http://www.conservation.org.cy to set up an umbrella association called Voufa under which the weavers could co-operate. Their greatest wish was to engage the interest of artists around the world as well as Cyprus and also to get a training scheme of some sort off the ground before these techniques become lost. 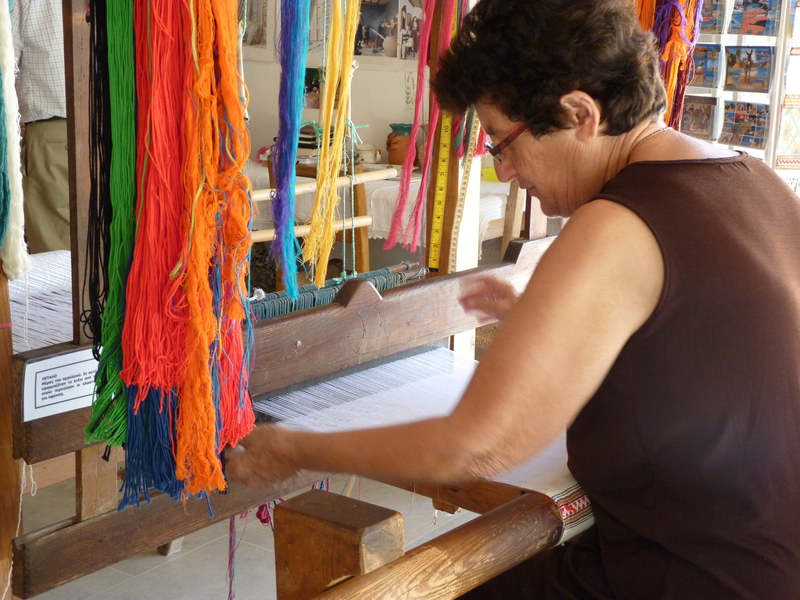 Fythkiotika is a well-known and well-loved weaving technique in Cyprus. In times, not that long ago, every woman would own a loom and know how to weave, this way of life has passed and will not return but there surely must still be young women who would like to learn these skills. 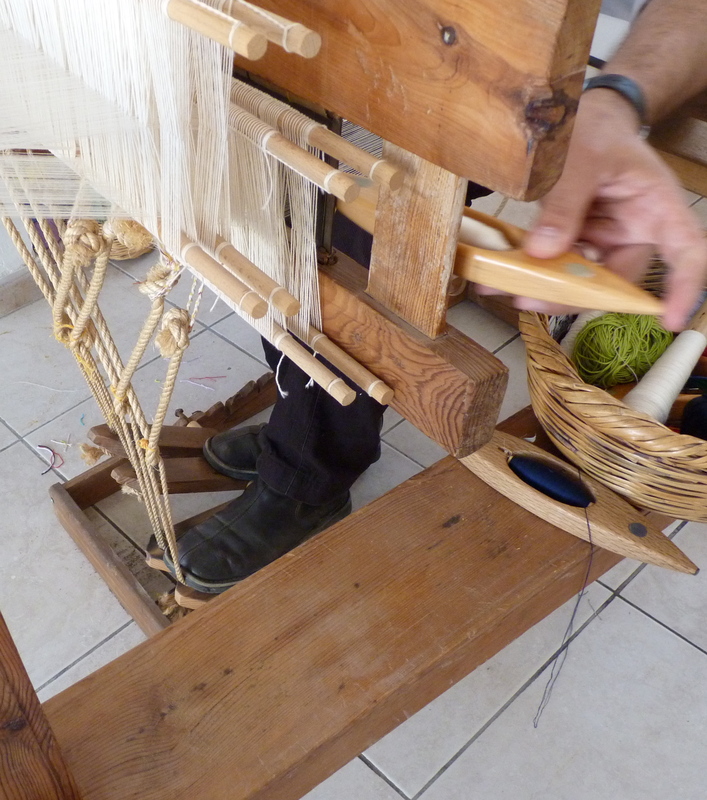 The Handicraft Services in Nicosia have many weavers who practise this technique and teach so there is still a tentative continuation. It is refreshing to see a new generation of Cypriots taking an interest in these ancient skills wherein lies so much of the unique Cypriot identity. One of the ways to ensure the continuation of these skills is to find new ways of applying and promoting them. Bravo Othonos. Although I have known about Fyti and Fythiotika for a long time I have never visited Fyti until this week. I was keen to see Mr & Mrs Mavrellis who run the Folk museum. I had read about them and the weavers of Fyti on the Phytiotika web site and Maura McKee and Sara Dixon’s passion to get Fythkiotika weaving practised more widely again, as it’s in danger of disappearing. Traditionally the craft would be handed down from mother to daughter but now this chain is broken, as with so many other small villages, the young move away to find work elsewhere and the population is diminishing. As I’m staying in Polis I didn’t have a very long journey to get there winding up the hillside after taking the E712 road to Simou and Lasa turning off the main Polis road. Passing the Evretou Dam I arrived at this attractive, peaceful village with some very good traditional stone buildings some of which have been restored. One that particularly took my fancy was a large house on the edge which has impressive views of the valley below from its upper doorway. Now in a state of dilapidation and housing chickens in the lower rooms, it looks as if it was a substantial residence at one time with evidence of the stone arches that would have opened onto the courtyard and my imagination was set to work envisaging it being restored into a very fine house indeed. Although many houses are abandoned and in various stages of dereliction there has been a lot or restoration work undertaken of some of the main buildings and more still is planned and the village has a prosperous well cared feel to it, in its past it was a centre for learning in the 19th century. 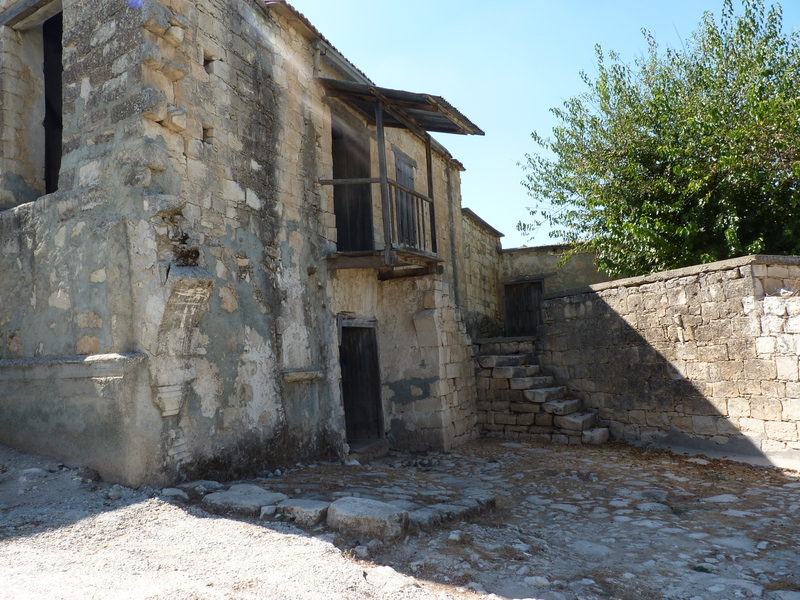 On the edge of the main square where you will find the church and the tavernas there is the Folk museum run by Mr. Mavrellis a former schoolteacher. His wife sits at the loom most days quietly weaving the traditional Fythkiotika a speciality of this village. There are many original patterns that are still copied with examples lining the walls and some of the older ones which are very intricate and dense, taking many days to complete are no longer made. Mrs Mavrellis at her work. Mr Mavrellis took me round the exhibits in the museum, implements used in farming and clothing of a bygone era as well as some lovely examples of the Fythkiotika of course. Lessons are available for those wishing to take this up and plenty of space available for accommodation in the new Voufa centre in the village. Sadly this was closed when I visited. On my wander around the village I visited a small art workshop where I met a young British artist Gemma Plant at work making jewellery and promptly bought a very reasonably priced pair of earrings. She has lived in Cyprus for 6 years since doing a post-graduate course at the Lemba Art college. As I was reluctantly leaving the village I came across a large herd of sheep being herded across the road and stopped to take some photos and chat to the shepherdess, it made my day. 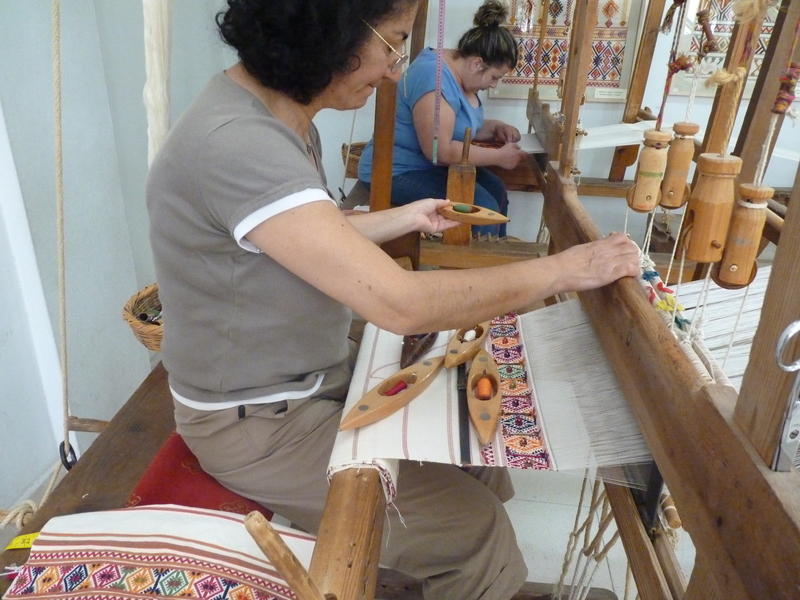 As I have mentioned before, Sara Dixon and Maura McKee from the UK have joined forces with the weavers of Fyti and the Laona Foundation in Cyprus to find ways of not only preserving the weaving traditions of Fyti but Cypriot weaving traditions in general. This is a project not just to preserve the past but to carry these valuable skills forward into the future where they can be discovered by future generations to use and innovate. A report is now out, as you will see above, where the meeting of all those concerned have produced various strategies and now various actions to get the project moving forward. It is very exciting to see what can be achieved with energy, enthusiasm, collaboration and communication. Since the initial meeting between Maura, Sara and the people of Fyti, weaving classes have been set up as well as some cookery classes available to anyone interested and some accommodation is available locally, the idea is to get the classes running and then slowly more facilities can be put in place as the project becomes established. Traditionally weavers have always been self- employed and their work sold piecemeal, so many women who possibly would like to earn an income from weaving are worried that there is not enough demand or the price they will get paid per piece not enough to enable them to earn a regular living. But as the report shows, demand outstrips supply at present and with more exposure and more being produced I am sure there will be no shortage of buyers. I for one would welcome a wider choice of availability and it would be exciting to see the different districts once again producing their individual weaving styles. Please check out the report and the Phytiotika Facebook page where the latest updates on the project and activities can be found or the website whose link is found on the blogroll right. I’m very excited …it doesn’t take much. Today, while searching WordPress for other blogs relating to topics I cover in my book ‘Androula’s Kitchen’, I came across Phitiotika. 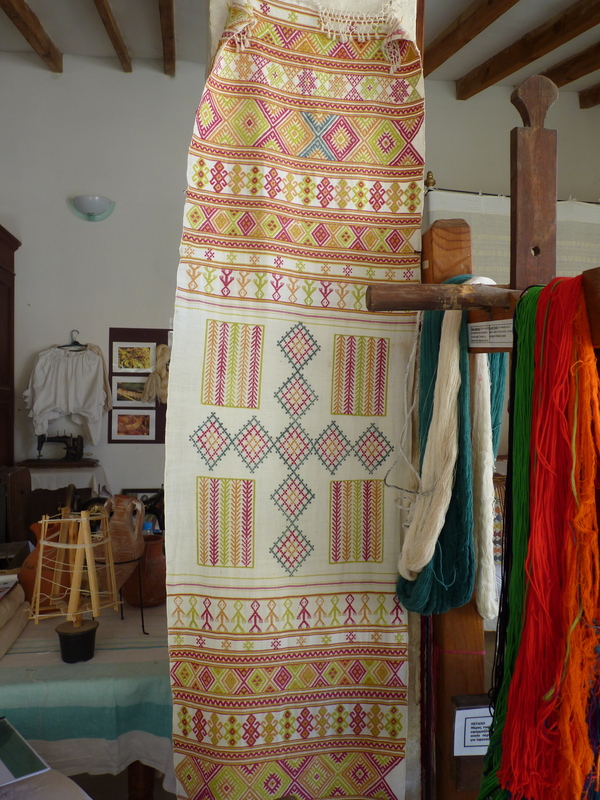 It is a site set up by two British artists Maura McKee and Sarah Dixon, they both have connections with Cyprus and had a strong empathy with the weavers of Fyti who are struggling to keep their weaving traditions alive in a dwindling village. They, like myself, feel there should be a way to carry on the strong traditions and heritage of weaving in Cyprus, through the younger generations by encouraging innovation and diversity. Throughout the centuries Cyprus has had a reputation for fine weaving. Each region had their own specialities and styles. At one time their was an abundance of silk and silk weaving was commonplace. Each family would own a loom and the women of the household wove all the linen needed for everyday life including their clothing and bedding. Silk worms were cultivated, cotton grown and there were plenty of sheep to supply wool. 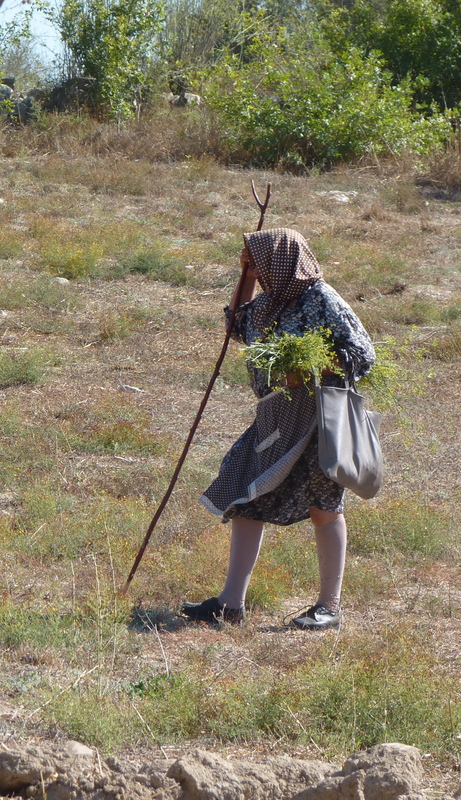 Silk is no longer cultivated and the weaving of silk has not been practised in Cyprus since the 1960s. Life has changed rapidly and people live different lives where there is no necessity to make everything themselves with mass production and cheap imports. You can find out more on their blog, the link is on the blogroll and join their Facebook page. I wish them both every success in this endeavour as this issue is close to my heart.